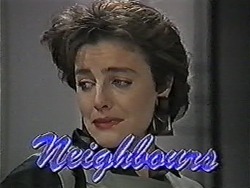 - Gloria taking a phone call from Henry and then telling a terrifed Madge that he wants to speak to her. HILARY: This one – which should be *thrown* over the falls! Helen says she thinks she knows what's happened: Hilary‘s ‘27' on the order form must have looked like ‘21', because that's what she got. Hilary snaps that she'll demand a refund. Helen, however, retorts that she won't get it: the gallery isn't a department store. Nick chips in to ask Hilary angrily how his painting even *got* in the exhibition if it's so bad. HILARY (witheringly): Haven't you ever heard of ‘family favourites'? HILARY (aghast): How dare you! Thank you very much for your help, Helen. I shall be speaking to your co-conspirators first thing in the morning. With that, Hilary storms out. MADGE: I'd almost convinced myself I'd never see Harold again. I don't know how I would've gone on. 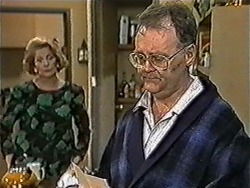 Gloria looks down at the ground sadly, and Madge apologises to her quickly. She adds that Gloria should go and be with her family. 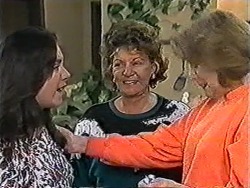 Kerry tells Gloria that she doesn't know what to say. Gloria and Madge hug and Kerry sees Gloria out. Madge stands there looking relieved that Harold and Toby are alive. PAUL (sighs): Bev, there's more to it than that. I mean, ever since the accident, she's been acting as if I'm not here anymore. She blames me for the whole thing – I just *know* it. PAUL: And if she doesn't? BEVERLY: Be patient and be there. She's suffered a tremendous loss. Sooner or later she's going to need you to lean on. SHARON: Why don't you let me hang it in *my* room? Then you won't have to look at it at all. HILARY (tersely): Yes, well, if Helen had used her influence, *none* of us would have to look at it. Matt points out that Helen said she'd try and sort things out, but Hilary retorts that she won't hold her breath. 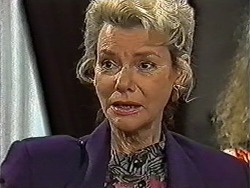 Sharon tells her that Ronald Webster bought *six* of Nick's paintings. SHARON: Webster. He's an art speculator. He's always making a killing on some hot, new talent and he obviously thinks Nick's hot. HILARY: Sharon, don't you think you're a little bit too old to be making up stories? SHARON: It's true! If you don't believe me, you can ask Helen. HILARY (dismissively): Oh yes, yes, very reliable under the circumstances. With that, Hilary tells Matt to come along, and the two of them head out. There's still no answer, though. Paul sighs heavily. JOE: Oh, matey, what a way to get out of school! JOE: Did you rub two sticks together, Harry?! TOBY: Course not – he took waterproof matches with him. Be prepared! TOBY: I got washed away in the river – thought I was a goner – but Baloo jumped in and grabbed me and then kept us both afloat until we could get out. HAROLD: Unfortunately, that was eight or nine kilometres downstream, on the wrong bank, and in very heavy bush-land. TOBY: We were OK once Baloo found us something to eat and then got a fire going to dry us out. JOE (looking puzzled): Who's this ‘Baloo' character? TOBY: The bear, of course! Just and wise. JOE: Ah yeah, that's Harold all right! HAROLD: I'm a little sore and quite tired, naturally. HAROLD: Were you, Madge? Were you really? MADGE: Please don't frighten me like that again. I couldn't stand to lose you. TOBY: At first, we had to use the fire to get dry and keep warm, but on the second day we poured all these green leaves on to it to make it smoke. TOBY: When the cubs go away on their next camp, can I go? JOE (frowns): We'll see, mate. We'll see! SHARON: So now she's even telling you what to *eat*? MATT: Yeah, well, she's my coach. My diet's as much her business as how many laps I swim. Sharon asks Matt if he doesn't want to get *away* from his mother occasionally. Matt, however, tells her that he and Hilary have been apart for 17 years, and if they can share this he's more than happy. The front door bangs suddenly and Nick comes in. He's holding another music box. Sharon asks him if he's thought about Hilary's painting. Matt points out that she might grow to like it. Sharon suggests suddenly that Nick could buy it back and show it again and re-sell it at his next exhibition. Nick, however, retorts that it's the principle. JIM: I felt *sure* Gail would break down during the service. BEVERLY: Me too. I don't think it's good for her, bottling it all up like this. PAUL: This is how she's been since the accident. I just can't seem to get close. 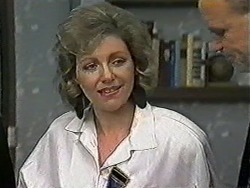 BEVERLY: Make sure you stay available, Paul. Sooner or later it'll all come pouring out. PAUL: Speaking of work, I'd better get going too – I've got one of the girls from Reception holding the fort. 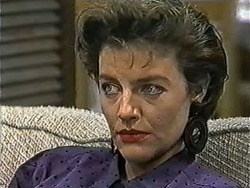 A look crosses Gail's face. Paul tells her that he won't be long. He gives her a kiss and heads off. Gail sits there, looking annoyed. MADGE: For a while there I thought we were *both* going to be widows. HAROLD: Oh ho, I wasn't going to let that happen. We've got far too many good years ahead of us, eh? HAROLD: I want you to know I'd *never* betray you, love. MADGE: Yeah, I know. And I will never doubt you again – I promise. 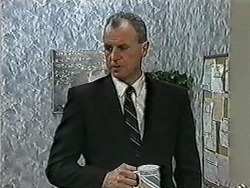 HAROLD: Oh dear... it would seem that I have been the cause of an awful lot of hurt. I'll be very sorry to lose Robyn's friendship, Madge, but I would've been even *more* sorry to have lost *you*. All I could think of while I was out there in the bush was whether we'd be able to sort this out – and what I'd do if we couldn't. Oh, I love you so much, my dear. MADGE: Oh Harold, let's never hurt each other again. JIM: Where *did* those parts come from? JIM: Well, I have to tell the police *something*. BEVERLY: Then Paul was *right*? Gloria nods her head. 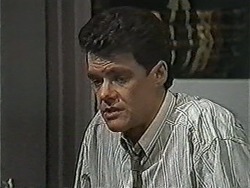 Helen comments that this has all put a tremendous strain on Paul and Gail's relationship. Gloria says she'll have to be told eventually – but she was taking her dad's death so badly, and she couldn't spoil his image – not at a time like this. Beverly, Jim and Helen all stand there looking concerned. NICK: It was the second music box: it just about broke the bank. HELEN: I have some good news for you. I've spoken to the gallery owner and, as a favour to me, she's agreed to take Nick's painting back. HILARY (bluntly): Thank you, Helen, but that won't be necessary. NICK (looking surprised): You mean you want to *keep* it? HILARY: I checked up on this Ronald Webster. He's apparently made several fortunes investing in unknowns. Now, although he hasn't always backed a winner, I'm quite prepared to gamble on his judgement. HILARY: I'm merely hoping it will appreciate sufficiently for me to be able to swap it for a Frank Darcy – *real* art. TOBY: I don't want to wait until dad's married – I want to call you ‘granddad' *now*; except for Cubs, of course, when you're Baloo! TOBY: And can I call Mrs. Bishop ‘grandma'? HAROLD (warily): Ah. Um. She'll be over directly – why don't you ask her then? JOE: To tell you the truth, Harry, I... actually wasn't... you know... that keen on having you as a father-in-law – but, well, after what's happened, you might not be an Earl, mate, but you're a champion. Neither of Joe, Kerry or Harold knows where to look! JIM: Rob knew those spare parts were stolen. PAUL (frowns): How do you know? JIM: Gloria told us. She didn't want Gail to find out; she didn't want to destroy Gail's image of her father. PAUL (snaps): That's all very well, dad, but Gail's image of *me* at the moment is at rock bottom. I think she needs to be told the truth. JIM: I can understand that. Do you think you could hold off for a while? PAUL: No, I don't think I *can*. The ‘phone starts ringing suddenly and Paul answers it, looking annoyed at the interruption. With that, Gail goes and picks up a packed bag and, tears in her eyes, stands by the front door, looking around at what she's about to leave behind.